Bottom line: Many of the organizations use various strategies to define, plan and reach their objectives. 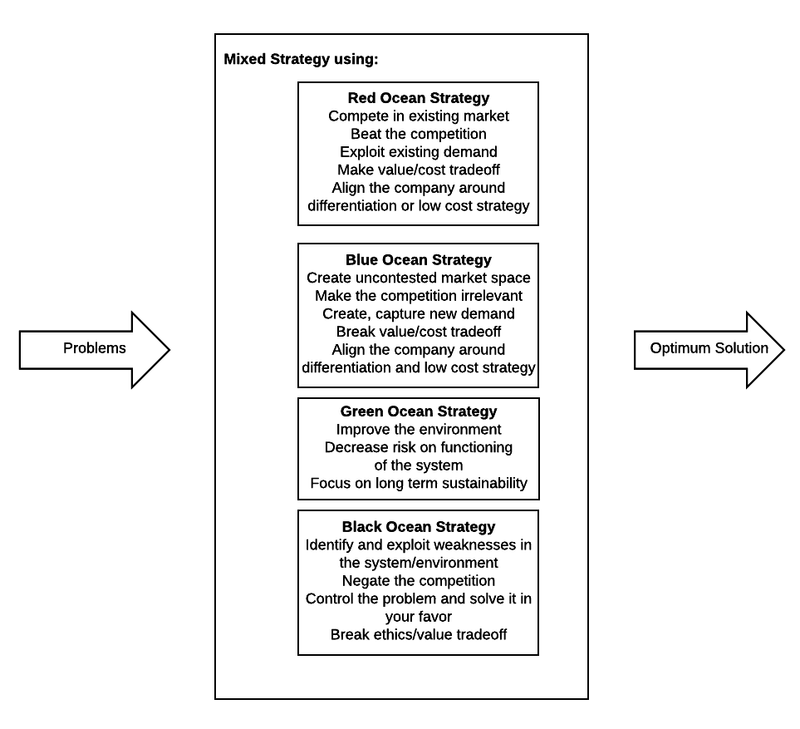 In this paper, the author looked at competitive strategies (Red Ocean), monopoly strategy (Blue Ocean), sustainable strategy (Green Ocean) and unethical strategy for survival (Black Ocean) to develop the concept of optimum strategy which they called White Ocean Mixed strategy. Considering organizational and business constraints, the optimum strategy is the best strategy to fulfill the objectives of an organization. In this research paper, the author defined corporate strategy as “the positioning and relating of the organization to its environment in a way which will assure its continued success.” In that sense, in a perfect world, executives would be able to develop an ideal strategy that solves all the problems and fulfill all objectives of an organization in any context. Ideal strategy ensures the sustainability of the organization with huge profit and the implementation is done with the least effort regardless of the changes in the competitive environment and of the internal changes. Given that the world is not perfect and full of constraints, executives need to aim towards an optimum strategy, called White Ocean Mixed Strategy, that would mix different types of strategies to support key questions around how to face competition, how to develop monopoly products and services, how to maintain environment for sustainability, how to manage turbulent situations for survival, and how to answer changes in internal and external environments to get long-term profit. Implement the strategy to achieve objectives and ensure optimum solution. Final words: Various strategies are used in organizations, but while strategies help executives to achieve their objectives, they all have their limitations. The concept of White Ocean Mixed Strategy aims to solve this problem by using a mixture of all strategies available and by focusing on all aspects of organizational problems like profit, monopoly, sustainability, environment, and survival. The concept of White Ocean Mixed Strategy is mostly based on common sense and on using a whole-system approach rather than a cookie-cutter approach to strategy. Read more: Aithal, Sreeramana. (2016). The Concept Of Ideal Strategy & Its Realization Using White Ocean Mixed Strategy. International Journal of Management Sciences and Business Research ISSN 2226–8235. 5. 171–179.